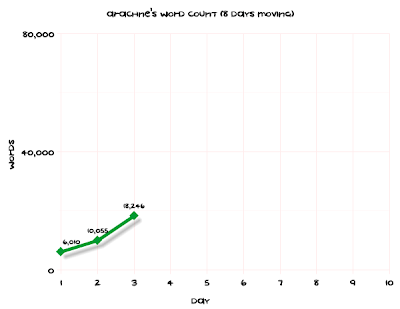 I’m not too fond of the Flash graphs on the NaNoWriMo site, so I found a place to generate my own: Create A Graph, an education site (and a .gov too; who’d have thought! It’s a colorful little site). The program is very friendly, as you can imagine, and lets you download the finished graph in multiple formats. On the Print/Save tab, I clicked on “Download” and chose PNG for my image format (it explains what each format is).